Lindt chocolate offers an unrivalled taste sensation that satisfies all your senses. Our gift box collections allow you to express your gratitude to someone special or celebrate any occasion in the most memorable way. 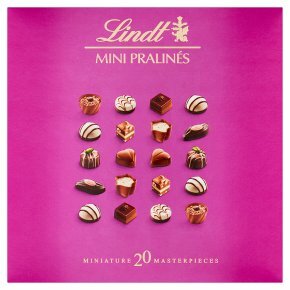 All Lindt gift boxes contain an assortment of exquisite chocolates to experience moments of pure indulgence. Miniature 20 masterpieces. Dark chocolate with caramel cream and almond taste Hazelnut soft nougat with hazelnut pieces Orange caramel filling in a dark chocolate heart Macchiato milk chocolate cup Almond & hazelnut soft nougat White & dark chocolate with orange marzipan* Pistachio marzipan* Marc de champagne truffle* Dark chocolate and milk chocolate with crunchy caramelized hazelnut pieces *These chocolates contain alcohol.